An unaltered photocopy of your DD-214 or other military issued document clearly displaying your award of the Coast Guard Special Operations Service. Coast Guard Special Operations Service Ribbon Authorized by the Commandant of the Coast Guard on 01 July, 1987, the Special Operations Service ribbon is awarded to members of the U.S. Armed Forces, serving in any capacity with the Coast Guard (and other individuals who participate in a special operation of the Coast Guard), not involving combat, after 01 July, 1987, and when that operation is not recognized by another award. The Special Operations Service Ribbon was established on July 1, 1987, by Commandant of the Coast Guard Admiral Paul A. Yost, Jr. 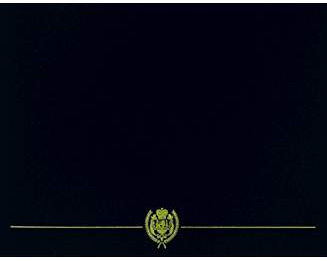 The Special Operations Service Ribbon has been in effect since July 1, 1987. 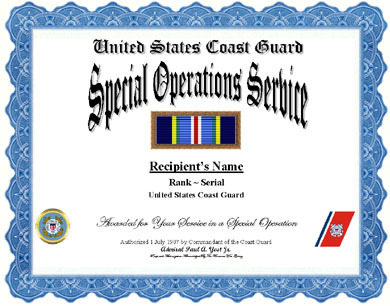 The Special Operations Service Ribbon is awarded to personnel of the Armed Forces serving in any capacity with the Coast Guard (and certain other individuals) who participate in significant numbers in a Coast Guard special operation, not involving combat, and who have not been recognized by another service award for the same operation. The following categories of special operations represent events for which this ribbon may be authorized. * Coast Guard operations of a special nature involving multiple agency involvement pertaining to national security or law enforcement. The Special Operations Service Ribbon is worn after the Military Outstanding Volunteer Medal and before the Coast Guard Sea Service Ribbon. Subsequent awards of the Special Operations Service Ribbon are denoted by bronze service stars three-sixteenths of an inch in diameter.